light controller IP68 SL1024 10A 12/24V_Solar&Wind Product_Product_Get high quality goods directly from the original factories! 1. Using the Epoxy resin sealed technology, increased the function like: fall-proof, earthquake-proof, waterproof, corrosion-proof, moisture-proof, and so on. Waterproof grade: IP68. 2．System voltage : 12V/24V automatic switch . 5．Multi-working model choosing, multi-parameter adjusting, make the products more intelligently, more useful. 6．It has temperature sensor outside, can make the temperature compensation more precise. 7．More advanced charging and discharging control algorithm, effectively increase the use of solar panels’ rate and battery life. 9．Controller with infrared wireless receiving and sending function, matching the remote control can be achieved on the wireless programming to the controller. 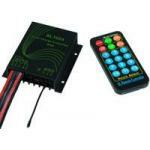 If we use IRF remote control with LCD screen to complete more function setting for the controller. Controller recognizes dawn and dark by checking the open circuit voltage of solar panels. 12V system default is 2.5V as identified point (24V is 5V as identify point). Continue more than 15s and higher than 2.5V that is considered to be the daylight, continue more than 15s lower than 2.5V that is considered to be night time.